Hello and welcome to my Seagull Artist Cameo review. I’ll also provide video of the Cameo in action so that you can get an appreciation of the tone for yourself and some user reviews so you can read about other people’s opinions. The first thing I noticed about this guitar – and this has nothing to do with the tone – or at least I don’t think it would affect the tone – is the weight of it. This guitar felt noticeably heavier than the average acoustic guitar. I’m guessing this has something to do with the solid maple back and sides or perhaps it’s just the thickness of the wood used. But in terms of tone this is a nice sounding guitar – and no surprise it’s all solid wood, but I did feel it was stronger in some areas than others. This guitar is a very bright sounding guitar. Definitely one of the brightest guitars that I’ve played recently. I would say that it’s an 8/10 for brightness, where 1 is the warmest and 10 is the brightest. This guitar was strongest in it’s low range. The mid range wasn’t very pronounced and was quite subtle. The low end was full and loud and had a lot of sustain. I felt the high end wasn’t to my taste. It was fine as part of a chord and was o.k. for fingerstyle but it was too bright for me for flat-picking. But keep in mind that everyone hears sound differently and I tend to hear something that’s tinny/scratchy when it gets too bright, whereas to another persons ear that might sound bright and crisp. Great for strumming, especially when you want your chords booming and you want them to ring out and have a lot of sustain. I also really enjoyed this guitar for finger-style, both in terms of tone and playability (I usually find Seagull’s nice for finger-style). I didn’t enjoy it as much for flat-picking. Like I mentioned earlier, I just found the highs too shrill for flat picking. But again, that’s my audio perception. I favor a warmer sound. The Artist Cameo is a Dreadnought. That contributes to that boomy, big sound that you get out of this guitar, in addition to the solid maple back and sides. The Artist Cameo comes with L.R. Baggs Element electronics. There is only one model and that is the Artist Cameo CW Element, which has a cutaway and electronics. There isn’t a non-cutaway, non-electronics option. You’ll never get the exact impression of the sound from a video but these should give you some idea. This next video is hard to get the raw acoustic sound from but is an example of what it’s capable of. 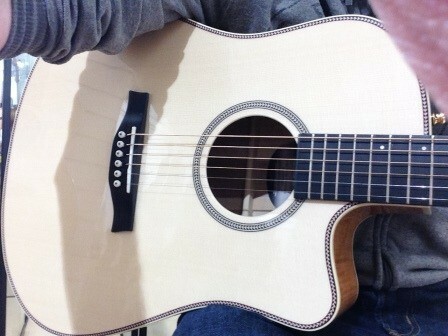 This guitar felt very good to play in general but it felt at it’s best for playing fingerstyle. I would lower the action on this guitar. That would be the first thing that I would do to it – and perhaps the only thing I would do to it. But for my tastes, the action is too high off the shelf. The Cameo has a 1.8” (45.7mm) nut width. This is wider than your average dreadnought acoustic guitar for sure, but typical of Seagull. This is part of the reason as to why it feels nice to play fingerstyle. The Cameo, like all Seagull guitars has a ebony fretboard and it feels nice and smooth to play on. The scale length on the Cameo is a 25.5” (648mm). This guitar is best suited to anyone who wants a bright but bassy guitar that has good sustain. And for anyone who likes to strum and play fingerstyle. It’s probably not a great beginner guitar – not just because of the price, but also because it has a full scale-length, is a dreadnought and is quite heavy. Also, I would say that you would definitely want to lower the action if you are beginner (I would personally lower it anyway, but even more so for a beginner). It’s a good option for those playing gigs too and for recording, assuming this is the kind of sound you want. For the fact that it’s all solid wood and you’re paying less than $1,500 I couldn’t say that it wasn’t value-for-money. It certainly is. It’s just not something I’m going to go out and buy – but that’s my personal preference in terms of sound. I’d have the Artist Mosaic over this any day – but I prefer a warmer more mid-heavy sound. If you’re interested in learning more about the Artist Cameo, are ready to buy or want to research prices and availability, check out the links below. If you want to compare this guitar to others in the same price range check out the next link.